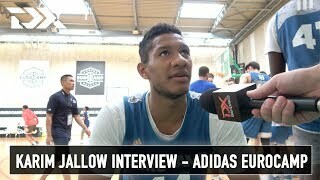 Karim Jallow is yet another fairly interesting German prospect attending this year's Eurocamp. Jallow had a strong year in the German Third Division, averaging 15.3 points, 6.3 rebounds, and 2.7 assists per game for Bayern Munich's second team. An active, aggressive player who likes to compete, the evolution of Jallow's jump shot and offensive skill set are areas of interest as there's quite a bit to like about his physical tools and motor at the wing/combo forward position.